Mülheim, November 7, 2018 – Turck is presenting HART modules for its excom I/O system with fully galvanically isolated channels. This prevents therefore any potential transfers and the resulting corruption of measured values. The temperature resistant HART modules for inputs (AIH401Ex) and outputs (AOH401Ex) enable excom to be used at all temperatures up to +70 °C. In this way, the I/O system can be placed even closer to the fieldbus instrumentation even under severe temperature conditions. The new HART modules process the information of multi-variable measuring devices, extended diagnostics or status information faster than previous devices. As the module provides its own communication controller for each channel, this information can be evaluated simultaneously. Another benefit is provided when HART field devices represent their main measured value digitally and not as a 4…20 mA signal: Digital signal transmission is firstly more reliable and secondly more energy efficient. Turck was able to keep the excess reactive power of the devices to a minimum. This improves the power balance of field device and remote periphery. The new modules enable existing excom customers to reduce the number of device variants that have to be kept in reserve. Modules with HART communication and galvanic isolation were previously classified as non-standard types. 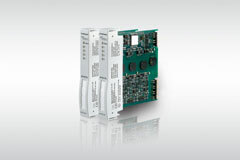 These types are now included in the new AIH401Ex input modules and AOH401Ex output modules, which are now available.